Documents about the Bosnian "pyramids"
The reality of the "pyramids"
The documentary film: "Revelation of the Pyramids"
After the mineralogist Aly Abd Barakat in June 2006, and the egyptologist Mohamed Ibrahim Aly in September 2006 , a new group of Egyptian scientists arrived in Visoko to lend their help to Mr. Osmanagic. They are two archaeologists from Cairo Faculty of Archaeology, Dr. Soleiman Hamed El-Heweli and Dr. Mona Fouad Aly, and the third is a member of Alexandria Archaeological Society, Dr Nabil M.A. Swelim; along with these three archaeologists is an old acquaintance of ours, Dr. Barakat. Let’s first notice that the texts published in the local press, and by various blogs (en) or uncritical portals (en), are often very similar, sometimes identical to the word: it is evident that it is the same press release from the Foundation, published by FENA (the federal press agency, that is itself one of the Foundation sponsors) and reprinted almost identically by the various newspapers. None of these has published a real interview with the Egyptian scientists, as was already the case with the previous foreign guests of whom the opinion was known mostly through the Foundation press releases. The one text that introduces faint differences, from Dnevni Avaz (bs), could make one think that either the journalists (or the Foundation author of the press release) "forgot" the conditional mood used by the scientists, or, in case the press conference was given in Arabian, the translator made quite a poor job. 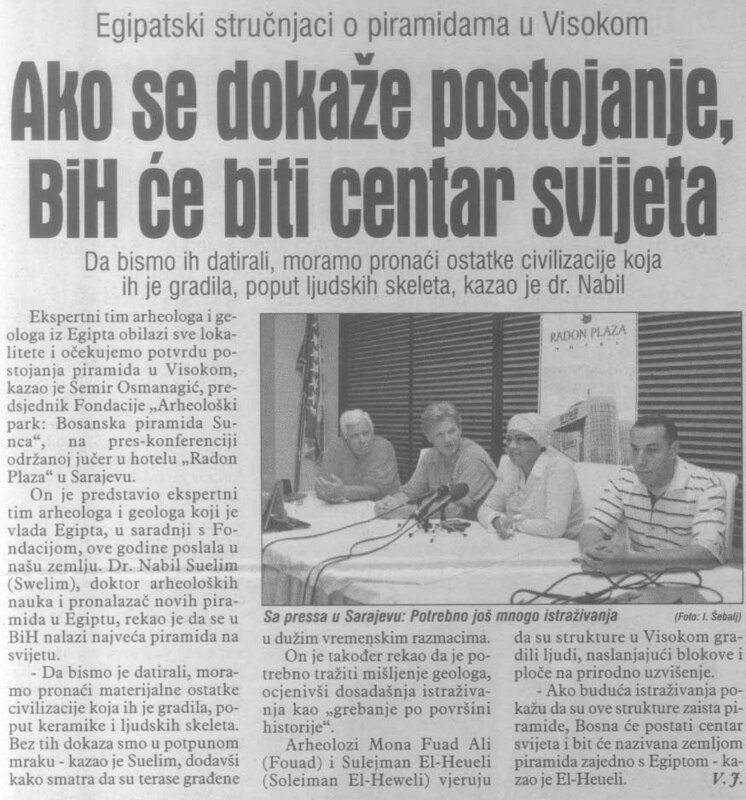 For instance, when the other newspapers announce "The world will soon call Bosnia the land of the pyramids (bs)", Dnevni Avaz title is: "If the existence [of the pyramids] is proven, Bosnia will become the center of the world"; in the article itself, Dr. Nabil Swelim explains that there is a total lack of remains from the civilisation of the builders, and deems it necessary to ask for the geologists’ opinion; and his colleague concludes the text saying "If the future researches show that these structures are really pyramids, then Bosnia will become the center of the world and will be called the land of the pyramids equally with Egypt": not one of these nuances appears in the other texts, nor in the English translation (en) that one can find on the Web. Well, all I can say is that one should really wait that these Egyptian scientists make a report, without journalistic "over-statements", or at least wait for a precise statement from a source other than the Foundation and the local press. As I have already written about Mr. Barakat’s "conclusions", one may wonder why egyptologists and Egyptian archaeologists, after 24 or 48 hours at the location, would be able to give an expert opinion more than the Bosnian scientists, who know much better the local history, archaeology and geology. Even if there were pyramids, they would have no link with the classical Egyptian civilisation; would you ask egyptologists to study Mayan pyramids? Last, one could bet that these statements will have no more sequel than Mr. Barakat’s, Mr. Andretta’s, Mr. Ibrahim Aly’s, Mr. Ben Badhann’s and other scientists’ ones that occured as "international validation" of Mr. Osmanagic’s projet: we still expect from these any somewhat scientific text, backing their support and their statements about the existence of the "pyramids". What are their arguments? What are the archaeological elements they rely upon? Could we get a scientific argumentation more elaborated than "we were convinced by what we saw"? It is more and more evident, with the passing of the time, that Mr. Osmanagic’s aim is not to convince the scientific community. What he wants are spectacular announcements and declarations to the newspapers - and demagogic speaches. He does not, and will not, try to publish anything in the scientific magazines, he is satisfied with convincing laymen and politicians. Then, why do scientists like these Egyptians get involved in this project, where they run the risk of tarnishing their academic reputation? Some (en) think that this last point is favourable to Mr. Osmanagic’s thesis. But one could also suppose that they are not well informed of what is really going on in Visoko, and of the stakes behind the "project", as well as of the way their polite statements will be used. And maybe there are somewhere other projects, not archaeological nor scientific, as one could suppose seeing the evident interest of the Egyptian government (see the Egyptian ambassador’s visits, and his meetings with Mr. Osmanagic) in the "Bosnian pyramids" affair. Shall we suppose that Egypt (like other Muslim countries, particularly Malaysia where Mr. Osmanagic has numerous acquaintances (bs) among diplomats and businessmen) has projects for economic investments in Bosnia, and uses some of its scientists as chance diplomats? The Egyptian scientists’ comments during this conference were in English, and the translation in Bosnian was made by Mr. Osmanagic himself. It’s difficult to check the quality of the translation (due to the bad sound), but I could notice for instance that, between the 6th and the 8th minute, when the Egyptian Mona Fouad Aly mentions the connections between the tunnels and that "which is said pyramid", M. Osmanagic is not as cautious as she is and translates as "the pyramid of the Sun". There is even quite a funny part, around the 12th/13th minute: Dr. Nabil Swelim explains that, among the questions raised, is that of the place of the "pyramids" in history, and says about this place: "historical? pre-historical? modern? "; Mr. Osmanagic, in his translation, totally forgets the "modern" hypothesis, and shows a funny face when his guest says this word. To be precise: I do not think that Dr. Swelim implied that the "pyramid" was a recent construction, at least nothing, in the sequel of his speech, was implying that (but nothing was implying an "antique" hypothesis either); what made me smile was Mr. Osmanagic’s reaction, and that he visibly was reluctant to mention in his translation that one could even consider the possibility of a "modern" pyramid hypothesis. I noticed that the Egyptian scientists were systematically calling Mr. Osmanagic "Doctor" ("Doctor Samir"): as fas as I know, if he actually wrote a "thesis" (see here), he never submitted it nor obtained a PhD. The more interesting speech is Dr. Nabil Swelim’s one, his colleagues giving only a few uninteresting generalities. Dr. Swelim seems to be convinced of the pyramids existence (at least he isn’t cautious in his speech not to mention the "pyramids" as is his colleague), but stresses some sore points. He mentions particularly the total lack of "remains" (pottery, bones and so on) from the builders ("and these are absent"... a sentence that M. Osmanagic totally "forgot" to translate), and the fact it is absolutely impossible to suggest any datation hypothesis. He especially points out one of the biggest difficulties, the problem of the "pyramid of the Moon" (Pljesevica) "structure" (see this article): one would have there a pyramid without any vertical wall, any oblique covering, made only of "terraces" intercalated with "clay" layers (in fact, they are mostly marls). How can we explain, asks Dr. Swelim, that artificial terraces (he seems to be convinced of the fact they are artificial) are intercalated with one meter or more of a "clay" that is natural? The possible answer he suggests is in my opinion quite far-fetched: a first terrace would have been made, then the "clay" forms or is deposited, and, a generation or even hundreds of years later a second artificial terrace is made and so on. He does well to conclude that the geologists will have their say about this hypothesis and the age of the various layers and terraces, as the hypothesis raises some difficulties: does Dr. Swelim have the slightest idea of the necessary time for the deposition of one meter of marl? does he imagine a construction of this pyramid of the Moon spread accross millions years? does he suppose that the terraces have been regularly drowned in water? if not, how could have been deposited these layers of "clay"? what will he say if the geologists confirm that these "clay" layers were deposited during the Miocene era? To make it short, the questions I would have asked Dr. Swelim, had I been present during the press conference, would have been : "What are the archaeological elements that make you able to claim with so much certainty that these "terraces" are artificial?" and "The contradictions and difficulties you point out in the pyramid of the Moon structure, would not they be easily solved if one would admit that these "terraces" are just natural layers, regularly broken by tectonic activity?" The third Egyptian scientist who came last year, Lamiya El Hadidy, never backed the hypothesis of pyramids; the one claim she made, "nature could not have created such a wall", does not apply to any of the pyramids, but rather to the small rectangular structure on Pljesevica, which is the single structure Ms. El Hadidy talked about, see here (en) and there (en). Discussions of the pyramids "affair"
Frictions inside the Foundation ? The book "The Bosnian pyramid of the Sun"
Christian Schwarz-Schilling, Mr. Osmanagic’s High Representative? "What happened to the objective and unbiased journalism?" 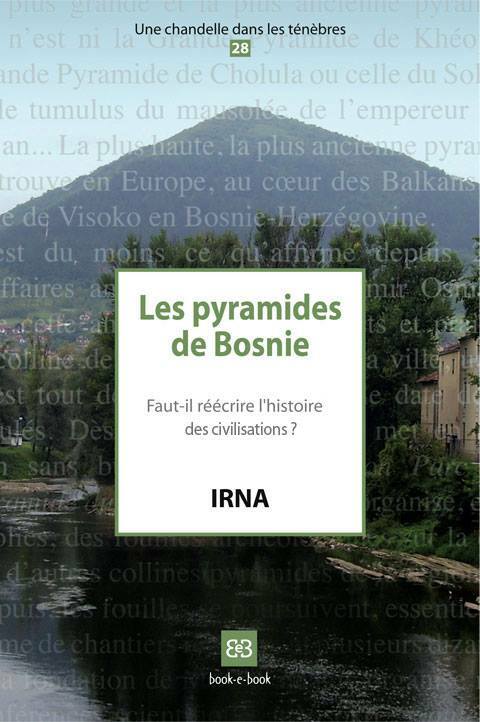 Nadija Nukic : "Osmanagic has driven away the scientists from the project"
The "valley of the pyramids"
Geology of the Bosnian "pyramids"
Stone balls : in France too! Did the Bosnian pyramids builders come through France ? Frauds, myths and mysteries: Feder on "Bosnian pyramids"
Mr. Osmanagic, protector of the Bosnian national heritage? An Open Letter to the Director of the SB Research Group. The pyramid fishermen: an extraordinary discovery! An "April Fools’ day fish" during the month of May? A new "expert" for Mr. Osmanagic’s Foundation! "Revelation of the Pyramids": Sitchin, or not Sitchin ? The radioactive skeletons of Mohenjo Daro. All that nature can never do, part III : "ripple-marks"
All that nature can never do, part V: conglomerate or concrete? Available as a book and as an e-book. You can order it at the publisher Book-e-book !